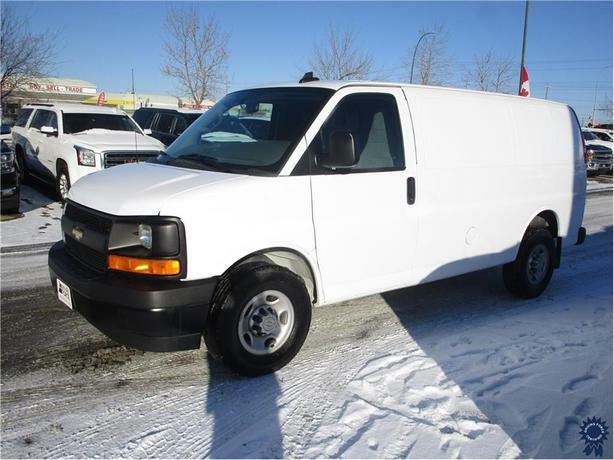 This 2017 Chevrolet Express 2500 Cargo Van comes with a 135-inch wheelbase, 6-speed automatic heavy-duty electronically controlled transmission, rear-wheel drive, 3.42 rear axle ratio, swing-out passenger side 60/40 split barn doors, summit white exterior color, driver and front passenger high-back bucket seats, single-zone manual air-conditioning, tilt wheel and cruise control, G80 locking rear differential, remote keyless entry, power door locks, power windows, inside rear-view mirror, rear vision camera, WiFi hotspot, Bluetooth for phone connectivity, steering wheel mounted audio controls, Cold Climate Package (engine block heater), 105-amp alternator, full-length ladder-type frame, power steering, tire pressure monitoring system, side windows defogger system, instrument panel-mounted tow/haul mode selector, oil life monitor, 120V power outlet, no rear cargo windows, rubber floor cargo area liner, floor-mounted D-rings, and GWVR rating of 8,600 lbs (3,901 kgs). The 4.8-litre Vortec V8 gas engine provides 285 horsepower at 5,400 RPM and 295 lb-ft of torque at 4,600 RPM. Touch base with us to discuss purchasing or financing options that are right for you and experience the difference you will only find at DRIVING FORCE Vehicle Rentals, Sales and Leasing.